Anthurium kamemotoanum Croat, sp. nov. TYPE: Panama. Panama: Cerro Jefe at summit, 23.4 km from Pan-American Hwy., Folsom 3831 (MO 2610308, holotype; K, PMA, isotypes; Live at MO). Planta epiphytica aut terrestris; cataphyllum modice coriaceum, persistens intactum; petiolus teres, 32-55(-68) cm longus; lamina coriacea, late ovata, leviter bullata, basi profunde cordata, 15-37 cm longa, 11-28 cm lata; inflorescentia erecta, pedunculus 4-11.5 cm longus; spatha cupulata, ovato-elliptica, purpurea ad violacea, suffusa viridis, 6.5-8 cm longa, 4-5 cm lata; spadix sessilis, violaceus, 3-6 cm longus; pistillus albus, conspicuc emergens; baccae ignotae. Epiphyte or terrestrial; stem less than 10 cm long, 2-3 cm diam. ; roots and leaf scars usually obscure, sometimes green to violet purple; cataphylls moderately thick, 9-17 cm long, sometimes tinged reddish, acute at apex with a minute subapical apiculum, drying reddish brown (B & K Yellow-red 3/10), persisting intact. LEAVES erect-spreading; petioles terete, 32-55(-68) cm long, 4-8 cm diam. ; geniculum 3-6.5 cm long, weakly and narrowly sulcate; blades coriaceous, broadly ovate, weakly bullate, abruptly acuminate at apex, deeply lobed at base, 15-37 cm long, 11-28 cm wide, broadest at point of petiole attachment; anterior lobe 10-26 cm long, the margins broadly rounded; posterior lobes 6-14 cm long (from apex of sinus to outermost point); sinus hippocrepiform to obovate, rounded at apex; upper surface semiglossy, lower surface slightly glossier, somewhat paler; midrib con-vexly raised above, flat to scarcely sunken near apex, acutely raised below; basal veins 4-5 pairs, the first free, those remaining coalesced to 4.5 cm, paler than surface, raised above and below; posterior rib naked, weakly upturned on outer margin; primary lateral veins 3-5 per side, departing midrib at 50° angle, weakly arching to collective vein, weakly sunken above, raised below; interprimary veins visible, flat; lesser veins conspicuous on drying; collective vein arising from the first basal vein, loop-connecting the primary lateral veins, weakly sunken above, scarcely raised below, 3-13 mm from the margin. INFLORESCENCE erect, shorter than leaves; peduncle 4-11.5 cm long, 4-8 mm diam., ca. one-third as long as petioles; spathe cupulate, ovate elliptic, violet purple to deep red-violet (B & K Red-purple 2/10) tinged with green, glossy on both surfaces, held parallel to and cupped around spadix, curving forward with the acumen directed downward, 6.5-8 cm long, 4-5 cm wide, broadest at about the middle, apiculate at apex, rounded to obtuse at base, inserted at 45° angle on peduncle; spadix sessile, deep red-violet (B & K Red-purple 3/5-3/10), 3-6 cm long, 0.8-1.4 cm diam. midway; flowers rhombic to 4-lobed, ca. 1.5 mm long, ca. 2 mm wide, the sides straight to gradually sigmoid or obtusely angular, 8-9 flowers visible in the principal spiral, 10-12 flowers visible in the alternate spiral; tepals glossy, minutely and densely punctate, lateral tepals 1-1.3 mm wide, the inner margin rounded, turned up against pistil; pistil emergent, white, conspicuously raised before stamens emerge; stigmas linear, ca. 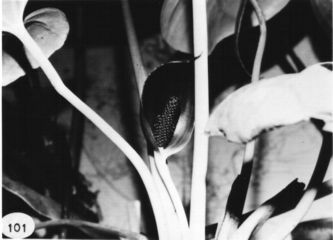 0.3 mm long, not conspicuously open before stamens emerge; stamens emerging spo-radically throughout spadix, beginning near middle, exserted on translucent filament, 0.2-0.5 mm long, 0.3-0.4 mm wide, retracting to hold anthers at edge of tepals; anthers creamy white, 0.2-0.5 mm long, 0.4-0.6 mm wide; thecae ovoid, slightly divaricate; pollen creamy white. INFRUCTESCENCE not seen. Figs. 100 and 101. Anthurium kamemotoanum is endemic to Panama and known only from the summit of Cerro Jefe at about 1,000 m in a premontane rain forest life zone. A member of section Calomystrium, it is distinguished by its persistent, intact cataphylls, its broadly ovate, coriaceous blades that are dark green above with the major veins markedly impressed and much paler beneath, and especially by its short pedunculate inflorescence with the distinctly hooding, boat-shaped, dark violet purple spathe with the acumen directed downward and by its deep red-violet, cylindroid spadix with sharply protruding, slender whitish pistils. 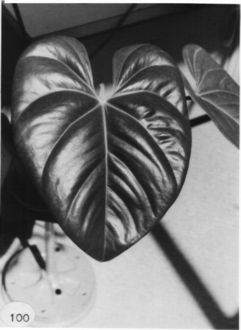 The species is confused with no other species though its leaves are similar to those of Anthurium roseospadix with which it occurs on Cerro Jefe. The latter species, however, has an erect or spreading, usually white, spathe (not at all hooding) and lacks the protruding pistils. The species is named in honor of Dr. Haruyuki Kamemoto of the University of Hawaii, who has made a significant contribution to this endeavor. Panama Panamá: Cerro Jefe, 850-900 m, 9.15N 79.30W, 12 July 1986, McDonagh et al. 33 (BM). Panama Panamá: 750-800 m, 9.14N 79.22W, 8 July 1987, Thomas B. Croat 67091 (MO). Panama Panamá: Cerro Jefe, 800 m,, , Croat 74005 (MO). Panama Panamá: 900 m, 9.14N 69.23W, 30 Nov. 1983, H.W. Churchill 3964 (MO). Panama Panamá:, 22 June 1977, J.P. Folsom 3831 (MO).